Check a visit to Pearl Harbor off your must-do list with this inter-island day trip from Maui to Oahu. 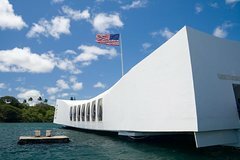 Get skip-the-line admission to the USS ‘Arizona’ Memorial and stop by the Pearl Harbor Visitor Center to watch actual film footage of the attacks. Round-trip airfare and transfers plus a Honolulu and North Shore tour are all included along with audio set so you can explore the site independently. Arrive at least 1.5 hours prior to your flight's departure from Maui to Oahu. You will fly out of the inter-island terminal and be greeted by a representative on arrival in Honolulu. After a brief orientation you are provided with tickets to the attractions at Pearl Harbor. Stop by the Road to War museums and the Pearl Harbor Visitor Center to watch actual film footage of the 1941 Japanese attack on Pearl Harbor. Once you're transferred by boat to the USS Arizona Memorial, there's no need to wait in line. Simply use your priority admission to explore this top Hawaii destination at your own pace. After fast-track entry and an audio tour, eat a hot dog lunch with plate of nachos, served in front of the USS Bowfin submarine. Next, your driver will pick you up for a guided tour around the North Shore. See spectacular views of the world-renowned shoreline, including Pali Lookout, Chinaman's Hat, Mormon Temple, Sunset Beach, Waimea Bay, and Turtle Bay. You’ll also visit Haleiwa and the Dole Plantation. Conclude with a brief Honolulu city tour before heading back to the airport, if time permits. Your driver points out historical landmarks such as the King Kamehameha Statue, Iolani Palace, State Capital, Washington Place, the First Church and the punch bowl national cemetery. From the inter-island terminal, you'll board your plane for the return flight to Maui.